It is three days away from Halloween meaning it's the time to start baking the most yummiest treats ready for that spectacular day! (If you celebrate Halloween). I personally do not celebrate Halloween, however I do enjoy making the yummy treats anyway to enjoy with a cup of coffee! You can make these cakes as vanilla muffins by removing the cocoa powder and using 780g of plain flour instead, or you can add some chocolate chips or fruit to them too! They also make 12 jumbo muffins, or they can make 24 regular size muffins, so perfect for a Halloween party too! Line a jumbo muffin tin with cake liners and preheat your oven to 200 degrees celcius. In a large bowl mix together the wet ingredients and sugar together. Sift in the flour, cocoa powder and baking powder and mix until combined. Pour into your cake cases and place in the oven for 28 minutes or until a skewer comes out clean. For the icing; use your favourite frosting and colour using gel food colouring. If you use liquid food colouring, with the amount you need the icing will taste disgusting. Using an Ateco 866 tip, pipe the frosting onto the muffins until you have an "Ice cream effect" on top. Meanwhile, melt some white chocolate until it is a runny consistency, add to a piping bag and cut off the end so there is a tiny hole. Using partchment paper, pipe spider webs onto the paper and wait for these to dry. Carefully take the paper off the spider webs and place these onto your frosting. 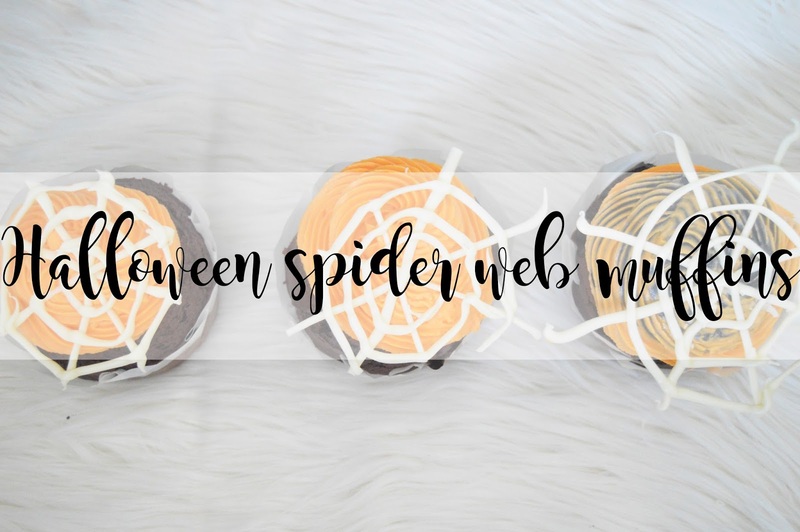 I hope you like these spider web muffins! If you make it, make sure to show me pictures via Twitter or Instagram! Have you made anything for this Halloween? This is not directly related to this post but I read your guest post on Jade Millard's blog and I have to say that I loved it! Honestly the best blog post I've read so far! Please write something like it on this blog, possibly about growing up with teenage issues?